Volkswagen's Touran has been confirmed as the biggest selling MPV in Europe. According to market research company IHS Automotive, the Touran asserted itself on the European Continent as the top selling MPV with more than 112,000 new registrations in 2016. The latest generation of the all-rounder with its innovative driver assistance, infotainment systems, fold-flat seating (with up to seven seats and 834 litres of boot space ), ranks as one of the most variable multi-purpose vehicles of any class. Volkswagen recently updated one of the Touran's most important driver assistance systems: the ACC (including front assist surroundings monitoring and city emergency brake function ). The adaptive cruise control now covers the speed range from 30 to 210km/h (previously 30 to 160km/h ). Combined with a dual clutch gearbox (DSG ), this spectrum widens from 0 to 210km/h. With ACC and DSG, the Touran now moves through stop-and-go traffic almost automatically, as within the system limits, it slows to a stop and pulls away again autonomously. 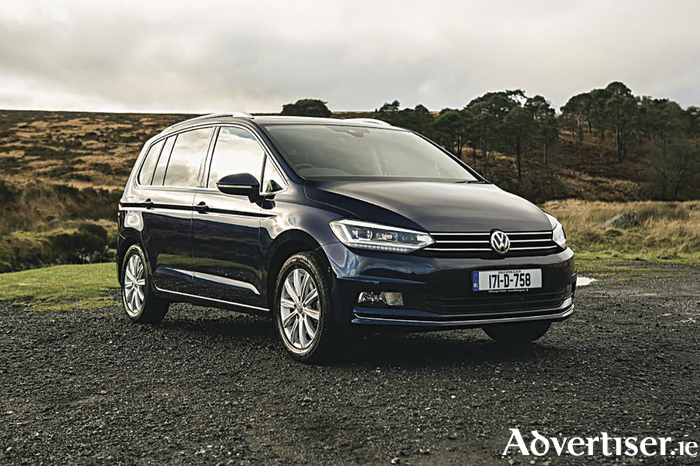 Prices for the Touran here in Ireland start at €30,045 and there is a €1,500 deposit contribution for cars ordered before March 31 as well as special finance rates on Highline models.